A few weeks ago, my mom and I decided to have a little girls date after I got out of class. She met me & we went to our closest outlets, which are about an hour away. They have a pretty decent selection of stores, but my most favorite is The Cosmetics Company. MAC, Nars, every perfume under the sun? They've got them all. I lucked up during this trip & found three of the Estee Lauder gift with purchases from the Lilly Pulitzer collaboration that they did. I snagged all three of these pieces for around $50...and the best part? They're chock-full of goodies on the inside! Let's see what's inside. . . 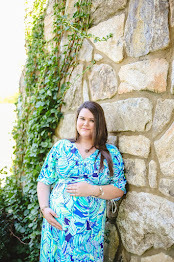 The print name is Shell Chic and I'm loving the blues, yellows, and greens! I cannot wait to use this as a pool tote this summer, it's so bright & colorful! I haven't tried any of these products yet, but I'm so excited to do so! The lipsticks are the perfect shades for Spring & Summer. This is the Lilly Pulitzer In Bloom print for Estee Lauder. The coordinating bag & eye shadow palette are SO cute. I love getting tons of new products to try, so this is going to be fun for me. This print name is Pucker Up & I'm loving those lemons! They did it again with the cute matching eye shadow palette, which has more muted colors which I love! The combs are also great for using when you get out of the shower so I'm glad to have some more of those! if you hurry & head over to your Cosmetic's Company store you may be able to snag these goodies. But if you're only interested in the tote or makeup bags check Poshmark, Ebay, or the re-sale pages for Lilly on Facebook because they're on there y'all...and for cheap! I saw several of the totes on Ebay for around $5, what a steal! Outlets are always so much fun! Oh how fun! Those are just the cutest! I'm so bummed that they aren't collaborating anymore, they were one of my favorites! I'm obsessed with it, I wish there was more in that print! I love outlet shopping! Always fun :) Love the sets you picked up, I'm a sucker for Lilly. I'm such a sucker for Lilly too, especially when it's for such a steal! So cute - love the "in bloom" print! Great pieces! Love the first bag! I definitely got lucky on this trip! This is amazing! I always love with Lilly does their collaboration with Estee Lauder! Great finds! That is a great find!! I wear the Candy lipstick all the time. I haven't tried it yet, but it's such a fun, springy color!